There is a dynamic that arises in researching church history that does not arise in the history of other cultures. During periods of fervor and persecution an 'end-time mindset' comes into play that keeps history from being recorded. The attitude that develops is simple, since Jesus is going to return at any moment, there is no sense recording these events as once He does return, history will be over and no one will care what happened previously. That may or may not have been the case shortly after the rise of Constantine, but it is one possible explanation. Whatever the reason, hardly anyone was writing anything down. In the early 4th century Constantine the Great was ruler of the Roman Empire and the persecution of the Christian church had ceased. And yet despite this new peace there is little recorded of the churches activities during this period. It is no stretch to imagine that the church's coming out from under the reign of persecution would yield some interesting sequences of events. But we'll never know, since few records of the church's activities at this time were made. One of the big unknowns from this period is the life of the bishop of Rome, St. Mark (no, not the gospel writer). I should note here that 'pope' is a title that was not applied to the bishop of Rome at this time, that would come later; however, the term is now applied to all who have held the office . We have no idea where or when he was born, though we are fairly certain Mark (Marcus?) was a Roman. The identity of his mother remains a mystery, but we know that his Father's name was Priscus. And that, gentle reader, is the sum total of all we know about his personal life. It's almost as if his life didn't begin until he was consecrated Bishop of Rome (pope) on January 18, 336. St. Mark only served as pope for 10 months, and while that isn't a lot of time I found myself intrigued by three undertakings that he did manage to get done in this short period. First of all, it seems that St. Mark realized nobody was recording much history and so he undertook to correct the situation. He sought to compile stories of the lives of martyrs and bishops before his time. If someone had thought to follow his example we might know a little more about him. History is full of many things and one of the most abundant is irony. Secondly, there are two churches in the area of Rome with pretty good arguments for having been founded by him, both built on land gifted by Emperor Constantine. One of them is named for him, the Church of San Marco. Renaming a church founded by a bishop after the bishop is a fairly common habit. The other church was located at the Catacomb of Balbina, the cemetery where St. Mark would eventually be buried. The third task is one over which there is some debate. According to some sources it was St. Mark who decreed that the Bishop of Ostia (a port near Rome) should be the one to consecrate the Bishops of Rome. Mark is also said to be the one who declared that the Bishop of Ostia would do so by bestowing a pallium upon the new Bishop of Rome. The pallium is a white wool sash that symbolizes the authority of the Pope, and anyone upon whom a pallium is bestowed shares in that authority. According to the Roman Church tradition, that authority comes in a direct line from the apostles themselves. However, some argue that since it will be almost two centuries later before there is a reliable record of a pope bestowing the pallium on someone else, it is unlikely St. Mark started the ceremony. Others argue that given the aforementioned spotty record keeping, the anecdotal evidence is as good a reason as any to give him credit. Why was Mark Bishop of Rome declared a saint? Like so much else about the man, we just don't know, although the use of the term appears on the list quite early. The character of a bishop elevated to saint can usually be found in the descriptions of him found in the writings of his peers, but again so few of these exist. A person named Mark associated with the church in Rome is mentioned in one of Constantine's letters from the time before he became pope, but there is nothing to confirm that the bishop is the man. There is also little evidence to suggest that a fragment of an old poem refers to Mark despite some scholars belief that it is. The poem reads, "filled with the love of God, despised the world . . . the guardian of justice, a true friend of Christ." If that is our man Mark, it is one of the greatest compliments that can be paid a servant of God, but again, there is no real evidence. Even the one piece of evidence we thought we could be sure of, a letter St. Mark was alleged to have written to Athanasius, the bishop of Alexandria who battled for the proper understanding of Christ's nature, has been shown to be a forgery. These days, the chance of having a dearth of information regarding modern church events is highly unlikely. With all the various media tracking everything just about everybody does, not to mention the vast number of amateur historians recording their perspective on the Internet, the challenge facing future students of history will be sorting out the real from the imaginary from the downright deceptive. Personally, I'd rather be searching for the needle in a desert than in the haystack. As stated earlier, we are certain of the date that St. Mark was consecrated Bishop of Rome. The other event we are absolutely certain of is the day of his death. Pope St. Mark died of natural causes, at an uncertain age, on October 7th, 336 - 1,671 years ago this week. 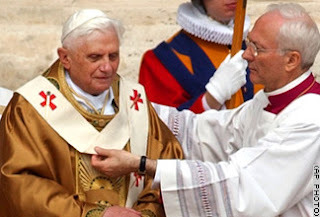 Photo credit: Pope Benedict XVI receives the pallium from Archbishop Piero Marini - CNN. October 1, 1529: The Colloquy of Marburg convenes. The gathering was intended to find common ground on which to unite the two main Reformation movements, those of Martin Luther and Ulrich Zwingli. There were 15 items of contention between the two groups; 14 would be resolved. The 15th, the Lutheran doctrine of the Eucharist (consubstantiation) was a point neither side was willing to compromise. The colloquy ended on the 4th in failure. As a result Switzerland stayed Reformed, Germany stayed Lutheran, and all hopes of a united Protestant front against Roman Catholicism died. October 2, 1792: A dozen young ministers from the district of Kettering, England, form the Baptist Missionary Society "for the propagation of the Gospel among the Heathen, according to the recommendations of [William] Carey's Enquiry." It would be the first foreign missionary society created by the Evangelical Revival of the last half of the eighteenth century. In short order other missionary societies were established, and a new era in missions began. October 3, 1789: George Washington names November 26 as a day of national thanksgiving for the ratification of the Constitution. On the same date in 1863, Abraham Lincoln designates the last Thursday in November as Thanksgiving Day. October 4, 1890: The "mother of the Salvation Army," Catherine Booth, dies of cancer. Besides preaching as a Salvation Army minister, she persuaded her husband, William, to include in the Orders and Regulations of the Salvation Army that "women must be treated as equal with men in all intellectual and social relationships of life" and "have the right to equal share with men in the work of publishing salvation." October 5, 1744: David Brainerd, kicked out of Yale for criticizing a tutor and attending a forbidden revival meeting, begins missionary work with Native Americans along New Jersey's Susquehannah River. Jonathan Edwards's biography of Brainerd was key in promoting Christian missions and was counted by William Carey (see Oct. 2nd above) as one of his most influential reads. October 6, 1536: English reformer William Tyndale is strangled to death and then his body is burned at the stake for the crime of translating and publishing the New Testament into the English language. It is of some smaller significance that Tyndale's translation was the first to be mechanically-printed in England. Quite why history is so interesting I can never quite understand, but it is!